The City and Borough of Sitka (Tlingit: Sheetʼká), formerly Novo-Arkhangelsk, or New Arkhangelsk under Russian rule (Russian: Ново-Архангельск or Новоaрхангельск, t Novoarkhangelsk), is a unified city-borough on Baranof Island and the south half of Chichagof Island in the Alexander Archipelago of the Pacific Ocean (part of the Alaska Panhandle), in the U.S. state of Alaska. As of the 2010 census, it had a population of 8,881. 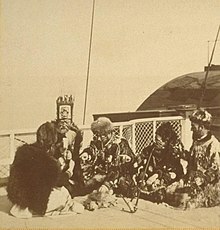 The current name Sitka (derived from Sheet’ká, a contraction of the Tlingit Shee At'iká) means "People on the Outside of Baranof Island," whose Tlingit name is Sheet’-ká X'áat'l (here contracted to Shee). Gajaa Héen (Old Sitka), circa 1827. The new Russian palisade atop "Castle Hill" (Noow Tlein) that surrounded the Governor's Residence had three watchtowers, armed with 32 cannon, for defense against Tlingit attacks. 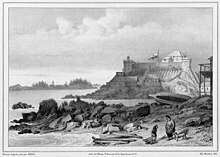 The Russians settled Old Sitka in 1799, calling it Fort Saint Michael (Russian: форт Архангела Михаила, t Fort Arkhangela Mikhaila). The governor of Russian America, Alexander Baranov, arrived under the auspices of the Russian-American Company, a colonial trading company chartered by Tsar Paul I. In June 1802, Tlingit warriors destroyed the original settlement, killing many of the Russians, with only a few managing to escape. :37–39 Baranov was forced to levy 10,000 rubles in ransom for the safe return of the surviving settlers. Following their victory at the Battle of Sitka, the Russians established New Archangel as a permanent settlement named after Arkhangelsk, the largest city in the region where Baranov was born. The Tlingit re-established a fort on the Chatham Strait side of Peril Strait to enforce a trade embargo with the Russian establishment. In 1808, with Baranov still governor, Sitka was designated the capital of Russian America. The Cathedral of Saint Michael was built in Sitka in 1848 and became the seat of the Russian Orthodox bishop of Kamchatka, the Kurile and Aleutian Islands, and Alaska. The original church burned to the ground in 1966, but was restored to its original appearance, with the deliberate exception of its clockface, which is black in photographs taken before 1966, but white in subsequent photos. 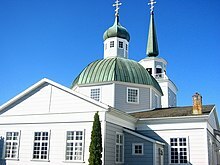 Swedes, Finns and other Lutherans worked for the Russian-American Company, and the Sitka Lutheran Church, built in 1840, was the first Protestant church on the Pacific coast. After the transition to American control, following the purchase of Alaska from Russia by the United States in 1867, the influence of other Protestant religions increased, and Saint-Peter's-by-the-Sea Episcopal Church was consecrated as "the Cathedral of Alaska" in 1900. The Alaska Native Brotherhood was founded in Sitka in 1912 to address racism against Alaska Native people in Alaska. By 1914 the organization had constructed the Alaska Native Brotherhood Hall on Katlian Street, which was named after a Tlingit war chief in the early period of Russian colonization. In 1937, the United States Navy established the first seaplane base in Alaska on Japonski Island. In 1941, construction began on Fort Ray, an army garrison to protect the Naval air station. Both the Army and Navy remained in Sitka until the end of WWII, when the Army base was put into caretaker status. The naval station in Sitka was deactivated in June, 1944. The Alaska Pulp Corporation was the first Japanese investment in the United States after WWII. In 1959 it began to produce pulp harvested from the Tongass National Forest under a 50-year contract with the US Forest Service. At its peak, the mill employed around 450 people before closing in 1993. Sitka's Filipino community established itself in Sitka before 1929. It later became institutionalized as the Filipino Community of Sitka in 1981. Gold mining and fish canning paved the way for the town's initial growth. Today Sitka encompasses portions of Baranof Island and the smaller Japonski Island (across the Sitka Channel from the town), which is connected to Baranof Island by the O'Connell Bridge. The John O'Connell Bridge was the first cable-stayed bridge built in the Western Hemisphere. Japonski Island is home to Sitka Rocky Gutierrez Airport (IATA: SIT; ICAO: PASI), the Sitka branch campus of the University of Alaska Southeast, Mt. Edgecumbe High School (a state-run boarding school for rural Alaskans), Southeast Alaska Regional Health Consortium's Mt. Edgecumbe Hospital, a U.S. Coast Guard Air Station Sitka, and the port and facilities for the USCGC Maple. Sitka has an oceanic climate (Köppen Cfb) with moderate, but generally cool, temperatures and abundant precipitation. Only 5.1 days per year see highs at or above 70 °F (21 °C); conversely, there are only 10 days with the high not exceeding freezing. Extremes range from a −1 °F (−18.3 °C) low overnight on February 16–17, 1948, to a high of 88 °F (31.1 °C) July 30, 1976. Sitka first reported on the 1880 U.S. Census as an unincorporated village. Of 916 residents, there were 540 Tlingit, 219 Creole (Mixed Russian & Native) and 157 Whites reported. It was the largest community in Alaska at that census. In 1890, it fell to second place behind Juneau. It reported 1,190 residents, of which 861 were Native, 280 were White, 31 were Asian, 17 Creole, and 1 Other. In 1900, it fell to 4th place behind Nome, Skagway & Juneau. It did not report a racial breakdown. 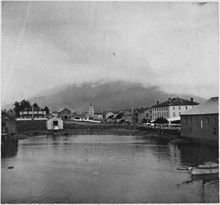 In 1910, Sitka was reported as two separate communities based on race: the village with mostly non-natives (population 539) and the part of the village with natives (population 500). Separately, they placed as the 15th and 17th largest communities. United, they would be 8th largest. For the purposes of comparison and the fact that the village was not officially politically/racially divided except by the census bureau report, the combined total (1,039) is reported on the historic population list. In 1913, Sitka was incorporated as a city, rendering the division by the census bureau for 1910 moot. In 1920, Sitka became the 4th largest city in the territory. In 1930, it fell to 7th place with 1,056 residents. Of those, 567 reported as Native, 480 as White and 9 as Other. In 1940, it rose to 5th place, but did not report a racial breakdown. In 1950, it reported as the 9th largest community in Alaska (6th largest incorporated city). It did not report a racial breakdown. At statehood in 1960, it became the 6th largest community (5th largest incorporated city). With the annexations increasing its population to 3,237, it reported a White majority for its first time: 2,160 Whites, 1,054 Others (including Natives) & 23 Blacks. In 1970, it fell to 14th place overall (though 7th largest incorporated city) with 3,370 residents. Of those, 2,503 were White, 676 Native Americans, 95 Others, 74 Asians and 22 Blacks. In 1980, Sitka rose to 4th largest city with 7,803 residents (of which 5,718 were non-Hispanic White, 1,669 were Native American, 228 were Asian, 108 were Hispanic (of any race), 87 were Other, 44 were Black & 7 were Pacific Islander). In 1990, Sitka fell to 5th largest (4th largest incorporated) with 8,588 residents. 6,270 were non-Hispanic White; 1,797 were Native American; 315 were Asian; 209 were Hispanic (of any race); 60 were Other; 39 were Black and 18 Pacific Islanders. In 2000, Sitka retained its 5th largest (and 4th largest incorporated) position. In 2010, it slipped to 7th largest community overall (but still remained the 4th largest incorporated city). There were 3,545 households out of which 29.5% had children under the age of 18 living with them, 45.5% were married couples living together, 10.7% had a female householder with no husband present, 6.1% had a male householder with no wife present, and 37.6% were non-families. The average household size was 2.43 and the average family size was 3.01. In 2010, Sitka's two largest employers were the South East Alaska Regional Health Consortium (SEARHC), employing 482 people, and the Sitka School District which employs 250 people. However, there are more people employed in the seafood industry than in any other sector. An estimated 18% of Sitka's population earns at least a portion of their income from fishing and seafood harvesting and processing. Many Sitkans hunt and gather subsistence foods such as fish, deer, berries, seaweeds and mushrooms for personal use. Within the total 2010 population of 8,881 residents, an estimated 7,161 were over 16 years of age. Of residents aged 16 and over, an estimated 4,692 were employed within the civilian labor force, 348 were unemployed (looking for work), 192 were employed in the armed forces (U.S. Coast Guard), and 1,929 were not in the labor force. The average unemployment rate between 2006 and 2010 was 6.9%. The median household income in 2010 inflation adjusted dollars was $62,024. An estimated 4.3% of all families / 7% of all residents had incomes below the poverty level "in the past twelve months"(2010). Sitka's electrical power is generated by dams at Blue Lake and Green Lake, with supplemental power provided by burning diesel when electric demand exceeds hydro capacity. In December 2012 the Blue Lake Expansion project began, which will create 27 percent more electricity for the residents of Sitka. The project was completed in November 2014. Sitka is the 6th largest port by value of seafood harvest in the United States. International trade is relatively minor, with total exports and imports valued at $474,000 and $146,000, respectively, in 2005 by the American Association of Port Authorities. The port has the largest harbor system in Alaska with 1,347 permanent slips. During Russian rule, Sitka was a busy seaport on the west coast of North America, mentioned a number of times by Dana in his popular account of an 1834 sailing voyage Two Years Before the Mast. After the transfer of Alaska to U.S. rule, the Pacific Coast Steamship Company began tourist cruises to Sitka in 1884. By 1890, Sitka was receiving 5,000 tourist passengers a year. Old Sitka Dock, located at Halibut Point, one mile south of the Old Sitka State Historical Park, commemorating the 1800s Russian settlement, and six miles north of downtown Sitka, is a private deep water port offering moorage facilities. A 470-foot-long floating dock for vessels up to 1100 feet was constructed there by its owners in 2012 and was first used in 2013. In Spring 2016, Holland America Line agreed to dock its ships at the Old Sitka Dock. Since then, the majority of the cruise ships calling on Sitka berth at the Old Sitka Dock, with the remainder anchoring offshore in Crescent Harbor and tendering their passengers to downtown Sitka. In the 2017 season, there were 136 cruise ship calls at Sitka with more than 150,000 passengers in total; of these less than 30,000 were tendered. There are 22 buildings and sites in Sitka that appear in the National Register of Historic Places. On October 18, Alaska celebrates Alaska Day to commemorate the Alaska purchase. The City of Sitka holds an annual Alaska Day Festival. This week-long event includes a reenactment ceremony of the signing of the Alaska purchase, as well as interpretive programs at museums and parks, special exhibits, aircraft displays and film showings, receptions, historic sites and buildings tours, food, prose writing contest essays, Native and other dancing, and entertainment and more. The first recorded Alaska Day Festival was held in 1949. The City and Borough of Sitka is a Unified Home Rule city. The home rule charter of the City and Borough of Sitka was adopted on 2 December 1971 for the region of the Greater Sitka Borough, which included Mt. Edgecumbe on Japonski Island and Port Alexander and Baranof Warm Springs on Baranof Island. The city was incorporated on 24 September 1963. On October 23, 1973, the city of Port Alexander was detached from the borough. Sitka hosts one active post-secondary institution, the University of Alaska Southeast-Sitka Campus, located on Japonski Island in an old World War II hangar. Sheldon Jackson College, a small Presbyterian-affiliated private college, suspended operations in June 2007, after several years of financial stress. Two private schools are available in Sitka: Sitka Adventist School, and The SEER School. Until its closing, Sitka was also home to Stratton Library, the academic library of Sheldon Jackson College. Alaska's first newspaper following the Alaska purchase, the Sitka Times, was published by Barney O. Ragan on September 19, 1868. Only four issues were published that year, as Ragan cited a lack of resources available at the time. The paper resumed publishing the following year as the Alaska Times. In 1870, it moved to Seattle, where the year following it was renamed the Seattle Times (not to be confused with the modern-day newspaper of the same name). KTNL-TV (CBS) broadcasts out of Sitka on Channel 13 (Cable 6) serving Southeast Alaska. Additionally, KSCT-LP (NBC) Channel 5, KTOO (PBS) Channel 10, and KJUD (ABC/CW) serve the region. In 2008, the League of American Bicyclists awarded Sitka the bronze level in bicycle friendliness making Sitka the first bicycle-friendly community in Alaska. In 2013, the Walk Friendly Communities program awarded Sitka with a bronze award, making Sitka the first Alaska community with a Walk Friendly Communities designation. Sitka is the only Alaska community to have both a Bicycle Friendly Community and a Walk Friendly Communities designation. Sitka was featured in a 2012 episode of the Travel Channel's popular series Bizarre Foods, starring Andrew Zimmern. In this episode Zimmern ate herring eggs, stink heads, and sea cucumbers. Sitka was named one of the Top 20 Small Towns to Visit in 2013 by Smithsonian magazine. The Long Dark takes place in the islands around Sitka. ^ Bunten, Alexis Celeste (2008). "Sharing Culture or Selling Out? : Developing the commodified persona in the heritage industry". American Ethnologist. American Anthropological Association. 35 (3): 382. doi:10.1111/j.1548-1425.2008.00041.x. ISSN 0094-0496.